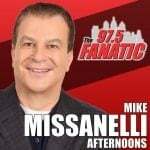 The Mike Missanelli Show kicks off after a busy sports weekend. The Sixers fall to the Nets at home in Game One and Mike is not happy with Ben Simmons. Tiger Woods also wins his first major in years.